Urging “maximum restraint” amid widespread anti-Government protests in Turkey, United Nations Secretary-General Ban Ki-moon and Navi Pillay, the world body’s human rights chief, called today for constructive dialogue to defuse tensions in the country. “The atmosphere is still clearly highly combustible,” said Ms. Pillay, who is the UN High Commissioner for Human Rights. “It is important that the authorities recognize that the initial extremely heavy-handed response to the protests, which resulted in many injuries, is still a major part of the problem. The initial demonstrations that began at the end of last month about the proposed redevelopment of Gezi Park in Istanbul developed into wider anti-Government protests, during which thousands of people were injured or overcome by tear gas. Riot police also used pepper spray and water cannons against protesters. Government officials later conceded that a disproportionate amount of force was used during the demonstrations. Ms. Pillay welcomed last week’s decision by the Government to put on hold further action on the park’s development until there is a court decision, and then to submit the issue to a local referendum. According to Office of the High Commissioner for Human Rights (OHCHR), at least four individuals have died so far in the clashes, including a police officer, although the circumstances of some of these deaths remain to be clarified. Ms. Pillay said she was particularly concerned about allegation of excessive use of force by police against peaceful use of protesters as this may have resulted in serious damage to health. The High Commissioner said the Government must ensure that the policing of demonstrations complies at all times with international human rights obligations and international standards on policing, and urged authorities to facilitate and protect peaceful gatherings and protests. Another cause for concern, Ms. Pillay noted, is the significant number of people – including lawyers and social media users – that have been arbitrarily detained, for acts other than recognized crimes. Reports of ill-treatment of some of those being held are particularly worrying, she said, calling for an urgent investigation into this matter as well as for reparations to victims of excessive use of force during detention. Also today, a spokesperson for Secretary-General Ban Ki-moon issued a statement in New York saying that the UN chief continues to “closely follow” developments in Turkey. “He remains concerned about ongoing clashes between protesters and security personnel,” the statement said, adding that Mr. Ban is saddened by the deaths and injuries that have occurred. The statement said that the Secretary-General urges “maximum restraint” and the pursuit of constructive dialogue in order to resolve differences and avoid further violent confrontation. “He believes that stability is best assured through such dialogue and when the rights to peaceful assembly and the freedom of expression are fully respected,” it added. 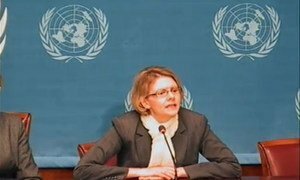 The United Nations human rights office urged the Government of Turkey to guarantee that its citizens have the right to assemble freely and in a peaceful manner, following days of violent clashes between protestors and police.